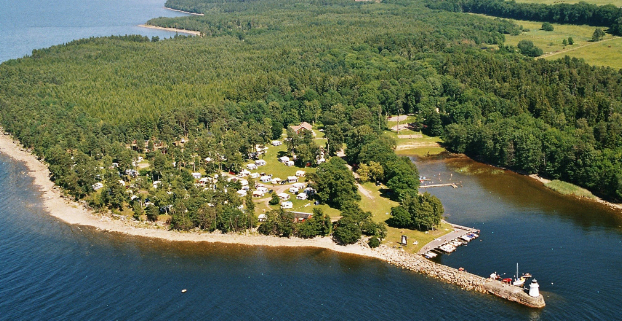 A tranquil family campsite close to nature and the beach where the "flowering mountain" Kinnekulle dips its foot into the waves of Lake Vänern. 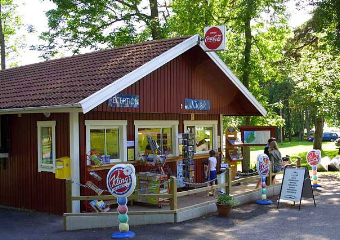 The campsite has a private location in beautiful countryside, yet it is centrally located with only 30 km to Skara (including Sommarland), Lidköping (with Läckö Castle etc) and Mariestad. The immediate area has something to cater for every taste and interest: medieval churches, "Munkängarna" with their special plants, Falkängens Handicrafts village, etc. The whole of the Kinnekulle area is also a geological paradise for amateur and professional fossil collectors. 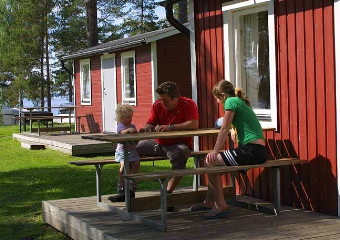 Children and adults can relax or be active at the campsite. We have motor boats, pedal boats, bicycles, minigolf and an amusement arcade. Also free of charge: fishing, swimming, volleyball, stilts, boules, trampolines, TV room with satellite dish, walking and jogging tracks. Our caravan and motorhome pitches are approx 100 sq m, and each site has a separate electricity reading. The tent area is located close to the beach and the service building for the convenience of our guests. 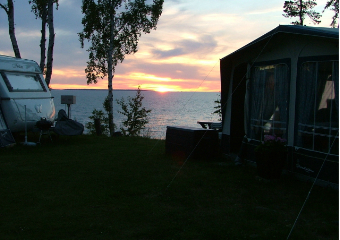 The campsite offers cottages and mobile homes with good location close to Lake Vänern. The cottages are equipped with cooking utensils, hob, coffee maker and fridge. The cottages have 2-4 beds. They are situated close to the facilities with toilet, shower, kitchen and dishwashing facilities. The mobile homes are equipped with kitchen, shower and toilet. The mobile homes have 4-8 beds.